End of the semester, and a good time for reflection. For their final assignment, we asked our graduate class that Jon Becker and I taught on Educational Technology and School Leadership to reflect on their 15-week journey. Their reflections are captured in the Wordle above. We had twenty-five K-12 teachers who immersed themselves in the Web 2.0 stream for a semester and examined applications to their teaching and to school leadership. The reflections indicated that they thoroughly enjoyed the journey. 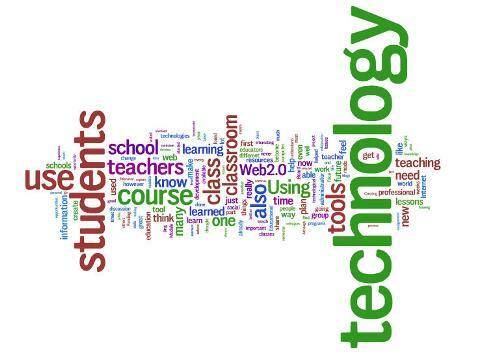 The Wordle points out some obvious observations – everyone focused on technology and their students. Many discussed the immediate application of web tools to their teaching in their own classrooms. I was struck, however, by some of the personal observations that did not emerge in this Wordle. One student noted that she had just been selected as Teacher of the Year for her school, which she attributed to her engagement in our class and her excited reapplication of her learning from our class into her own school. Another student stated that she had originally wanted to move out of the classroom and into administration because she felt burned out in the classroom. Our class had so re-energized her that she now saw that she could have a greater impact on children and learning by remaining in the classroom and helping her digital kids grow. Several students used the same term in their individual reflections – “life-altering”. While I am both proud and humbled by the impact this course had on many of our students, I suspect much of the impact was similar to the impact I saw in myself this past year. The more I network and connect, the more it impacts me on a personal level. Our students began to see this too. Many reflected that “professional development” had taken on personal aspects that they had never considered before. It was a paradigm shift to move from professional development as something you attend to professional development as something for which you take personal responsibility. My PLE contains traditional methods of information gathering like journals, listservs, and even morning coffee sessions. But I am also mindful of and tapped in to numerous web applications, where I hear the conversations taking place worldwide on topics of interest to me. Some of those conversations pop up in Delicious, some through my Google Reader, many from Twitter or Facebook. When I go seeking information, I tend to look in Delicious or Wikipedia, but I also still Google things, though I am increasingly looking to Twiiter as a search engine. 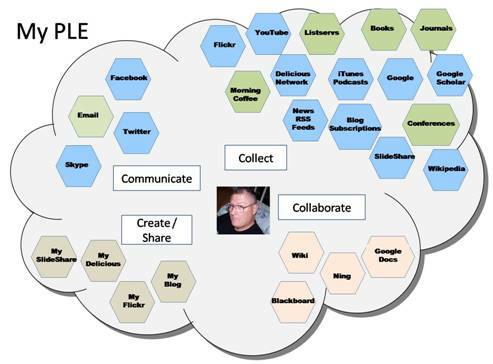 While I tried to collate items in neat areas of “collect, communicate, collaborate, and create/share,” the truth is that the interconnections are numerous and blurry. Twitter is all of the above. Our class wiki was all of the above. Delicious many times is all of the above. The key for me is that the web now weaves itself into all aspects of my work life at a deeply personal level. In keeping with the interactive nature of the web, it is no longer enough to passively receive information. Personal learning includes actively connecting and communicating with my network across multiple paths. It seems that the “buzz” about PLEs and PLNs has died down recently, yet I found it illuminating personally to relook at my own concept of my own learning environment and network. I suspect that it will continue to evolve. What do you think? What resonates with you? What seems off base? PreviousPrevious post: Are We Ready for Swine Flu?